I had not intended on running today. I had a good 90 minute trainer (i.e. cycling) ride earlier this morning and had a long list of “to-dos” to attempt to get through once the kids got off to school. Not to mention my heel/ankle has been… well.. let’s just say, it has not been healthy so my running has been limited. But all signs were telling me to run. The sky was that mystical cloudy gray with electric looking clouds. My shoes were at the front door “calling to me”. I had a long weekend and really just felt the need to go out and run. No agenda. No watch. No phone. But – truth be told – last minute I did grab my iPod. I RARELY run with music. It’s just not my thing. Never really was until a few years ago when I needed to turn off my brain (music doesn’t necessarily help but a girl can dream!). So, now, unless I feel like I need a little “power boost” then I leave it at home….. (today was a power boost kinda day). So I dropped off the kids at school and went on my way. You see, I love rainbows. Sure, they are gorgeous. They don’t happen often. But it is deeper than that. 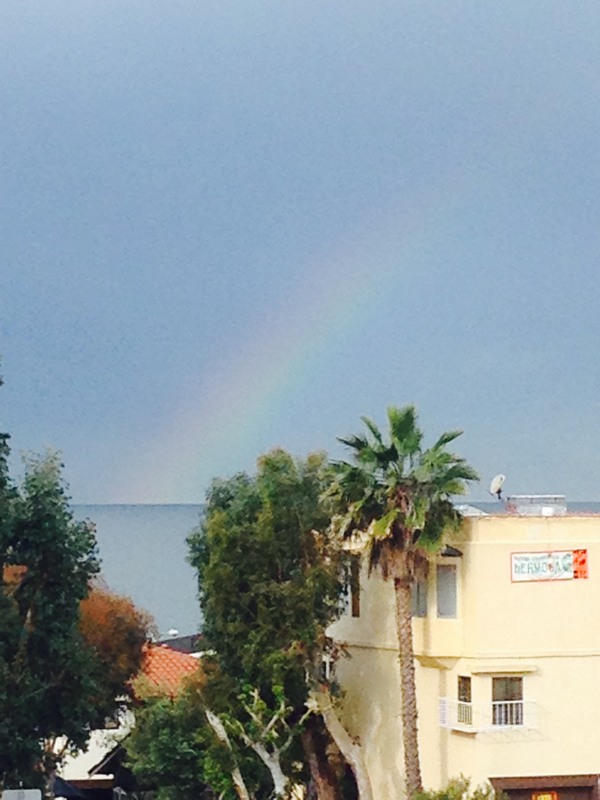 Outside of the hospital window during my father’s final hours there was a vivid, bright rainbow….. 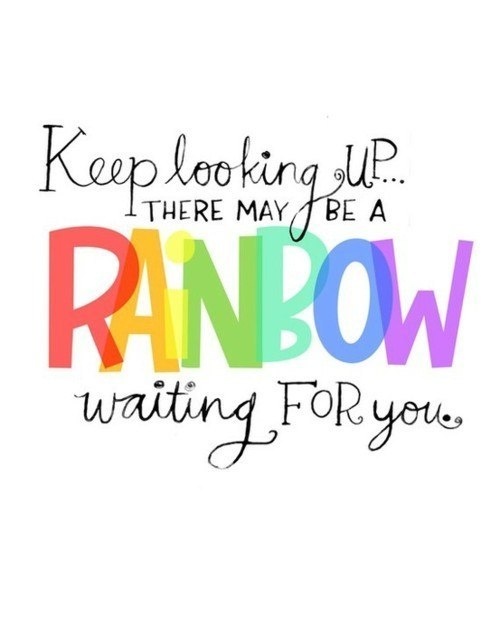 So let me believe that when I see a rainbow…. it is for a reason. Which is why I went out today on my run chasing rainbows. I was actually quite satisfied with the sky as gorgeous as it was (dark, cloudy and “electric” with the sun poking it’s head out every once in a while) that I was fairly content with my run. Just one of those great runs where you realize exactly WHY you run. While my heart was aching, it was so nice to be outside moving one foot in front of the other. Simple, yes. 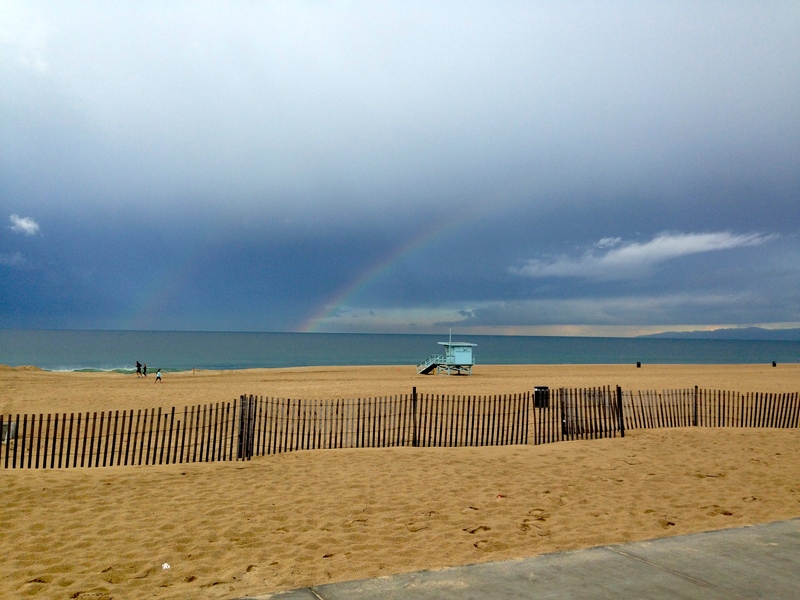 15 minutes into it – I turned towards the west and there it was – A RAINBOW!!! I must’ve looked like a prize idiot, because I darted off my trail, crossed the street, and booked it towards the beach. 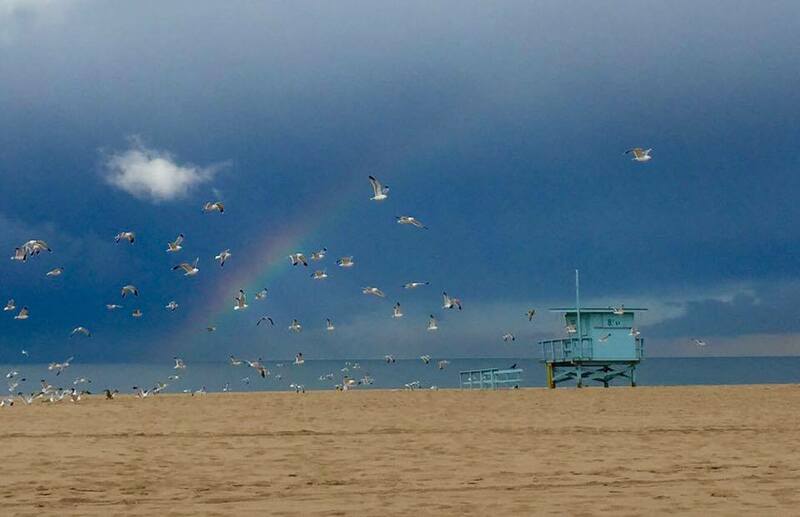 DUH, yes I know you can’t chase a rainbow!!! But, there I was.. chasing a rainbow. I’d like to say the pain lifted from my foot but it was still there (I was ignoring it). I’d like to say the pain lifted from my heart but it was still there (that is what they call a forever pain). I did manage to get a closer look and had to ask this nice man (who incidentally was already taking a photo of it) if he wouldn’t mind sending me a photo of this magnificent rainbow. I went on to run towards the beach as the tears welled up in my eyes. All I could think about was my dad. The guy who left us too soon. I decided to run (let’s be honest, was probably a jog at his point) down to the water’s edge just to get a better look. Although my heart felt weak, I felt strengthened. I took a deep breath and picked up the pace. I appreciated it and wanted to just soak it all in. Wishing I had worn my sunglasses (tears while running does nothing to enhance your look) but also just enjoying being out there with no agenda. No expectations. 2nd photo request – Double Rainbow!! Photo just doesn’t do it justice..
Several minutes later I saw a dear friend of mine running the opposite way – part of me wanted to head for the hills but the seal had already been broken. Fortunately she knew from just looking at me. There wasn’t a “how are you doing?” or a “what is wrong?” it was just a hug, then I turned around and we ran together. It evolved into conversation and was just what I needed. I turned towards home, the rainbow left us, the clouds came in, and the rain started as I finished the last few blocks home. My morning journey was over, yet it left me with such a powerful presence to fill my day. Who do you call to ease your pain? So friends…. 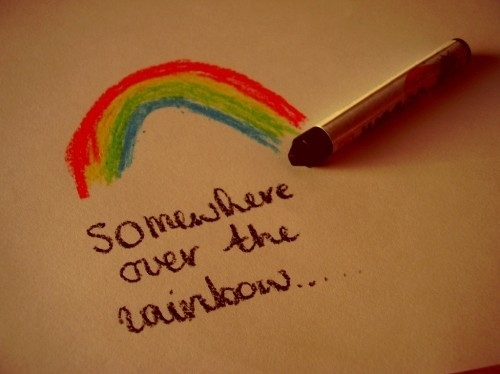 don’t underestimate the power of a rainbow. I loved reading this from the first word to the last. Wish I was there to see it yesterday with you.